I’m reading Paul Zahl’s “Grace in Practice”, and as I read it, instead of simply blogging about what I’m reading, I’m going to blog about my own thoughts on the issues he raises. I’m also going to skip around the book shamelessly at will as things interest me, no apologies! I also will have the foolish boldness to disagree wildly on some of these points, because I like to think my own thoughts. Apologies to those looking for short little blog bites for quick reading, this is heavy and even philosophical stuff. I realize this post may get 3 people in the history of the world who actually read through the whole thing, but it is important to me to work things out. I want to look at grace as it relates to government. The question of the church and the government usually revolves around issues of separation, keeping the church out of the state. It also involves keeping the state out of the church, and while that is really the original intent of the constitution, it is really the church’s responsibility to keep the state out. This means that we are not to be swayed by what seems popular or practical, we are to unflinchingly speak forth the principle of the thing. This is no light issue; Mr. Zahl makes the excellent observation that, perhaps in perverse harmony with Romans 13, the church in Germany went along with the Nazis when they could have been a powerful voice in stopping a monstrous evil. It is not the church’s job to be practical, it is the church’s job to speak the truth. I have personally been to Auschwitz, and I have seen how the road to genocide is paved with “forgivable sins”. I have seen and been deeply disturbed by the carefully engineered and orchestrated evil that resulted, I would say with great conviction that we ought always to think and speak right down to the deepest principle regardless of the practicality of the thing, and stand by that truth. I believe this means we are to stand apart from any political party, left or right, and advocate for grace and truth, regardless of who we offend. It is crucial. Now I want to specifically look at grace in practice as it concerns government and criminal justice. This really is a looming question: are we supposed to extend grace to people who have committed heinous crimes? Should we expect the government to forgive murderers? In the name of grace, are we supposed to advocate for the release of dangerous criminals? I agree with Mr. Zahl that we do not want to start dividing up the world, where in “religious” matters we advocate grace while in “secular” matters we advocate law. I have seen this given as the ‘correct’ answer to grace in practice in matters of criminal justice, because some religious council in the 1600’s assigned an obscure name to the idea, case closed. (Sometimes it is difficult not to be irritated with academic theologians!) I have always hated this answer. It is double minded and in the end, in every practical sense we deprecate grace. It says, God only forgives little sins in ways that never manifest in the real world, He never forgives in ways that count. I say that grace must remain monolithic, and its principles must extend to every stitch of human experience. However, I want to explore answers that differ from Mr. Zahl’s as concerns the way that grace applies monolithically to secular culture and to civic evil. To lay some groundwork, grace is not moral relativism; it honors the hard line of the law, and offers forgiveness. Grace does not try to redraw the lines of justice. Grace actually seeks to draw a much harder line of guilt, to offer a a greater and deeper and cleaner release from guilt. The more deeply you expose your disease to the doctor, the more able he is to apply his healing arts. No advocate of grace is saying that we should redefine the law to make harmful behaviors permissible. It would be like saying cancer is healthy. This is not the nature of grace at all. People want to paint the application of grace to matters of criminal justice as if we are pushing moral relativism, but this is not true in the least. Justice seeks the minimum intrusion of evil upon people. Grace is greater than justice, and seeks even greater blessing upon people. Thus if justice seeks to prohibit the visiting of evil upon many, how much more grace? If someone is going around behaving in a way that makes a lot of people miserable, however much grace seeks their welfare, it also seeks to stop them from damaging the welfare of many. This verse gives us the idea that deterrence should work, and if the sentence is delayed, you can expect to see deterrence fail. This is exactly what we have in most democratic societies – extremely delayed justice. So, I think deterrence does work, and I think the problem when it doesn’t work is that the sentence is wrong or is applied too slowly or perhaps too privately. Now, deterrence, swift public execution of punishment for a transgression as a means of dissuading others from similar transgressions, is not grace to the person punished. Don’t think I’ve gone nuts, we’re getting to that later. I’m only saying that deterrence works if the punishment for a transgression is done swiftly and sufficiently and publicly. It is ugly, but it is true. One last piece of groundwork: grace doesn’t say that we should be careful to delay justice because we may have the wrong guy. Justice says that we might want to delay, because we want to punish the right person. Grace says that we should forgive the guilty and so presses that both the guilty and the falsely accused be released. Now that we’ve laid some groundwork, here is the core idea: Let’s suppose that grace does say we should let criminals go free. Love seeks the maximum justice and love for the most people. If we let murderers go free in the name of grace, and so murder isn’t deterred, murder will proliferate. When injustice proliferates, obviously grace suffers all the more. Governments should capture and punish murderers, so that the maximum number of people can live free of the shadow and fear of murderers. However, grace has mercy for the sinner – all sinners. Let’s look at this through a real life scenario. Suppose a woman with children is married to a meth-addicted violent thieving monster. This story is all too common. It is only right for her to seek the state’s protection as an agent of grace to her. Maybe she shouldn’t have gotten mixed up with this bad man, maybe she shouldn’t have had children with him, maybe she has some strange predilection for ‘bad’ boys, but grace embraces her interests. We can’t trample her needs by extending ‘grace’ (meaning freedom to harm) to an out-of-control monster, because that would violate grace to her. Grace to her looks like protection. Shall we or God withhold her blessing by extending “grace” to a monster? However, in the middle of the act of protecting this woman, God seeks to extend grace to this terribly misguided man. Extending grace to him does not mean releasing him to the freedom to do violence against his wife again, nor does it mean setting him free to steal from the innocent to supply his habit. Grace extended to him means something else altogether, and grace to society in general may mean incarcerating him and even punishing him as deterrence, while yet holding out hope that in the end God may cause good towards him as well. 1Let every person be subject to the governing authorities. For there is no authority except from God, and those that exist have been instituted by God. 2Therefore whoever resists the authorities resists what God has appointed, and those who resist will incur judgment. 3For rulers are not a terror to good conduct, but to bad. Would you have no fear of the one who is in authority? Then do what is good, and you will receive his approval, 4for he is God’s servant for your good. But if you do wrong, be afraid, for he does not bear the sword in vain. For he is the servant of God, an avenger who carries out God’s wrath on the wrongdoer. 5Therefore one must be in subjection, not only to avoid God’s wrath but also for the sake of conscience. We have to remember that Paul is writing this from a perspective of grace, so we can’t in the name of grace throw it out! However, notice that it does not say that THE CHURCH bears the sword. It does not say that the church is a terror to bad conduct. However, as we have seen, it is not from grace that we would seek for rulers to stop opposing bad conduct with the sword. The law is good, including civil law. We are in the position of the rector in Les Miserables, who refused to press charges against the very man who had done violence against him and had stolen from him. We do not chastise the police who caught him and would seek to condemn him. 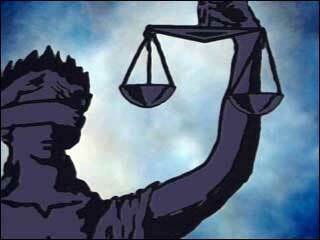 In the service of God, according to Romans 13, they are executing justice for the common public good. But as Mr. Zahl so wonderfully points out, we do not deal with society as a whole. We deal with individuals. On a one by one basis, we seek forgiveness and grace. One by one, we extend mercy as it is in our power. We give when someone cheats us. We bless when cursed. We love when we are hated. We have been shown great mercy and so we show mercy. This is the way of grace when those around are evil, even when the evil we are confronted with transgresses the law. Sin is sin whether it produces a twinge of guilt or life in prison, and forgiveness is forgiveness in either case. Just as in religious matters, we do not ask the governing authorities to change or bend the law, but we do seek grace and mercy in all circumstances for all people. A final thought. There is no rule here about what to do when the government is corrupt and should itself be resisted. There may be no single principle which can be written or spoken which could predict the form of such a thing. To seek such a thing is to seek to live under law, to seek a moral code which we do not need to understand or love, but merely obey. The situation on the ground is changing, and we must walk by the spirit to judge rightly when to resist, and it must not be done lightly or in a corner. Posted in Blog and tagged Grace in Practice. I would recommend the writings of John Howard Yoder, especially his book against the death penalty, The End of Sacrifice. 1. There are two kingdoms, but nobody can be a citizen of both. Christians are citizens of heaven who live on earth, and their authority and standard is “from heaven”. Telling those in rebellion against Christ’s kingdom how to do that is not our calling. 2. We should not pick and choose from the covenants and laws of God simply for the sake of “secular” pragmatism. We cannot justify killing some people to save the lives of other people. God’s sacred law to Noah, given in Genesis 9. was not deterrence and what works but about sacrifice to God: If you want the death penalty, then you should want the nation-state to decide which God is God and which divine laws are now in force. But if you agree with Hebrews that there is now no other sacrifice to God except the one Jesus Christ made, then you have no biblical reason to defend the death penalty. 1And God blessed Noah and his sons and said to them, “Be fruitful and multiply and fill the earth. 2 The fear of you and the dread of you shall be upon every beast of the earth and upon every bird of the heavens, upon everything that creeps on the ground and all the fish of the sea. Into your hand they are delivered. 3 Every moving thing that lives shall be food for you. And as I gave you the green plants, I give you everything. 4But you shall not eat flesh with its life, that is, its blood. 5And for your lifeblood I will require a reckoning: from every beast I will require it and from man. From his fellow man I will require a reckoning for the life of man. Thanks for the reference to Yoder, I may check his stuff out. He seems to have been a strange man. I’m not sure I’m convinced by your second point. Picking and choosing isn’t what I’m advocating. What I am suggesting is that if we are concerned for grace in society, the governing authorities need to exercise some kind of power over those who are producing harm to many others. I am saying that deterrence works and is the rightful operation of the state, as Solomon and Paul both teach. If the sentence is carried out slowly then deterrence is broken. It is wrong to think only of grace towards the perpetrator in a civil matter, it is also important to think of grace towards the victim or victims. There is also the matter of grace towards an entire society; can a nation expect blessing from God despite its mistakes in these matters? We submit to them. We can’t leave the wrath to God and then take it up ourselves. Your way of avoiding this is to say it’s not wrath but “deterrence”. But pragmatic utilitarianism is not what is commanded by any of the Pauline epistles. What you want to call “grace to the victims” is really revenge, wrath, a sense of justice vindicated. And of course I don’t deny the good or the importance of wrath, but Romans 12 clearly teaches that we are to leave it to God. One way to circumvent this is to divide ourselves into public and private persons, so that our personal selves hand over the wrath to our official selves. Another way is to say that non-Christians are legitimate in being agents of God’s wrath, doing their jobs that we are not called to. But I disagree with both of these ideas. I agree with the direction that Zahl goes. When Israel sins, Assyria’s wrath is used by God to punish Israel. And so Assyria could (and did) say to itself: we are doing God’s business for God, we are agents of God’s wrath. But even though God sovereignly uses evil against evil, God in the new covenant never commands anybody (Christian or nonChristian) to do evil, or to adminster wrath. The new covenant has no standards for such a thing. And it is simply not true that God commands it without giving a standard for it. If you were going to adminster wrath to somebody, you should do it according to God’s law. But God’s law now commands: overcome evil with good, love as Christ loved…..
What does it mean to “not bear the sword for nothing”? It means, punishment will rightly be carried out. This is supposed to stop you from doing it. Sounds EXACTLY like deterrence. Also, this is in the book of Romans, the very place we derive most of our most cherished ideas about grace and mercy and salvation. If we differ from Paul on this in the very section where he is working out the practicalities of living under grace, chances are strong we are not getting it right, whatever else we think.